This post may contain affiliate links that will earn us a small commission to help running the site if you decide to make a purchase of a recommended product or services. You will not be charged extra but your support is appreciated. So you’re planning a visit to the city of Milan in Italy and wondering what you can do there? We went over to this beautiful city for a weekend but ended up using one of our days for a trip to Venice, so we only really had one full day in the city to explore. You might be in a similar situation and be looking for things to do whilst visiting. 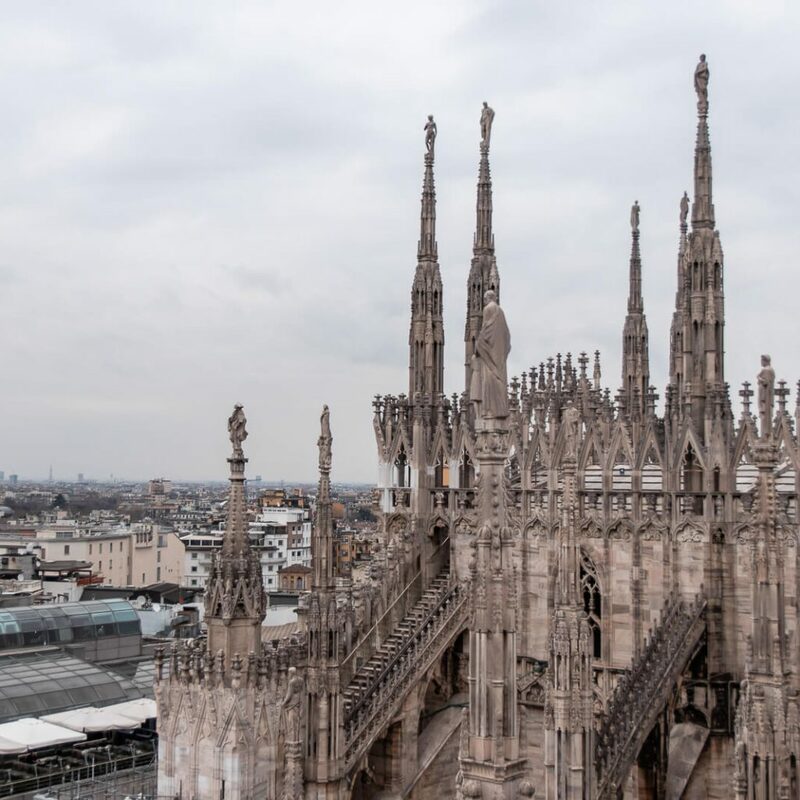 Hopefully this Milan one day itinerary can help you plan your day and get the most out of the time that you have in this wonderful Italian city. One of the most incredible monuments and standout pieces of architecture in the city is the Duomo di Milano. We made our way along to catch sunrise at the Duomo and boy are we glad that we did. The entire square, which is usually packed with tourists, was completely empty apart from maybe one or two people heading to work and someone cleaning the steps. It made for quite an incredible experience to have the entire view to ourselves and be able to watch the sun appearing over the top of the spires. We were lucky that we visited during the winter months, so sunrise for us actually happened at a reasonable time of about 8am, but for those visiting during peak summer it may mean getting up quite a bit earlier to take advantage of the quiet square. Opening times for the Duomo vary depending on which day and which part of the cathedral you want to see, so if you’re heading there super early, you may have a bit of a wait on your hands to get in and up to the rooftops. Thankfully, stop number two on the list is just next to the Duomo. If you’re standing looking at the front of the Duomo, over to your left you will find the entrance to one of the oldest and most beautiful shopping centres ever created. 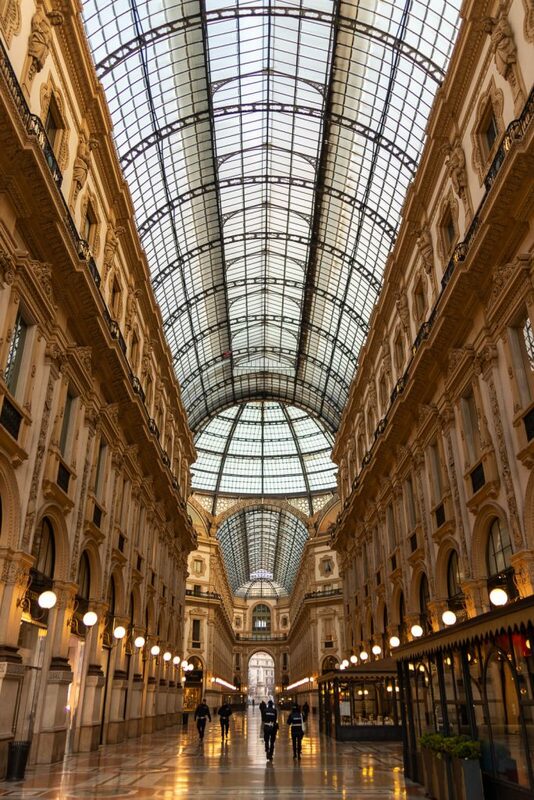 Housing high fashion brands like Prada, Gucci and Luis Vuitton amongst others is the Galleria Vittorio Emanuele II. Quite a mouthful. The shopping centre is shaped in a cross with beautiful murals and glass vaulted ceilings above. Directly in the middle where the four walkways meet is the crest of the bull which is the Turin Coat of Arms. You’ll probably notice that the testicles of the bull are somewhat damaged compared to the rest of the crest. This is due to a “tradition” which many Milan locals say is just something tourists made up of spinning on your heel three times on the testicles of the bull for good luck. The centre is one of the most impressive shopping galleries that I’ve ever been in and it’s easy to see why it’s such a draw for tourists. When you think of Milan, the first thing that comes to mind is fashion and this is the centre to see the latest in runway trends. Just a short walk from the Galleria we stumbled across this little piece of Hollywood history by complete chance and it’s easy to see why it’s not a too well known tourist attraction. Down a small side lane in a one of the nearby shopping centres and somewhat neglected is a miniature scale version of the famous handprints that can be found at the Grauman’s Chinese Theatre in Hollywood. Big names like Kirk Douglas, Angela Lansbury and Arnold Schwarzenegger, as well as some more local talents that we didn’t recognise the names of, have left their hand prints on floor tiles. Sadly as we mentioned these have been almost forgotten and don’t look well taken care of, with many of the tiles scratched, broken or hidden under seating areas for some of the cafes in the centre. If you’re interested in pop culture and have never experienced Hollywood then it’s definitely worth taking a walk past but could easily be skipped for those who aren’t interested. Just a five minute walk from the main area of the Duomo is a more morbid but equally intriguing piece of architecture. This unassuming building looks like a normal church building inside, but over to the side of the main worship area is a room that definitely isn’t for the faint-hearted. 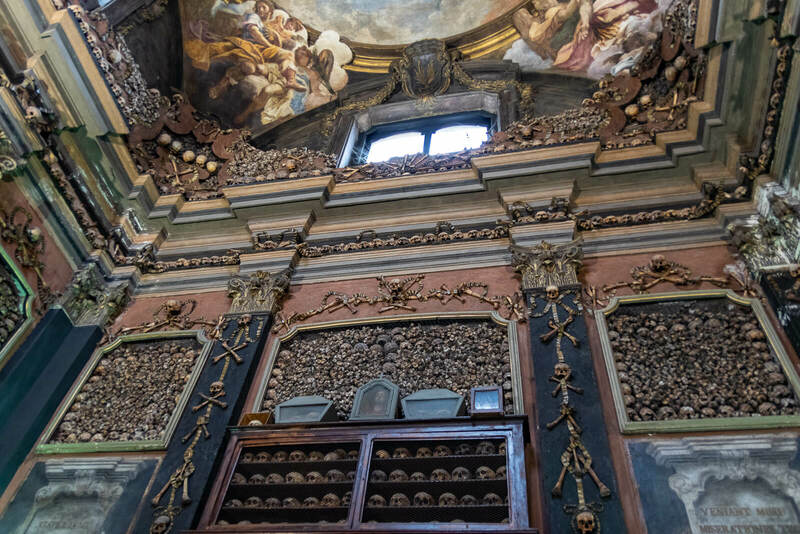 The Ossuary was originally built in the year 1210 to accommodate the bones of the dead when the cemetary was running out of space and following a fire in the 17th century, was rebuilt in the most stunning fashion. Today it makes for an incredibly unique experience with the bones set out in ornate decorative styles of crosses and neatly stacked piles behind metal grates. The ceiling is also beautifully decorated with traditional paintings. San Bernardino alle Ossa is another lesser known piece of history that you won’t find many people visiting and can quite easily spend plenty of time in here without seeing any other tourists or even locals for that matter. Entry is free but a donation is welcomed for the upkeep. If you’ve been following the itinerary, it should be around opening time for the rooftop at the Duomo. There are two ways to get up to the roof, with varying costs for each. The two options are to take an elevator (more expensive) or to take the stairs. We took the latter as we quite enjoy climbing up the stairs of such a history filled building. The walk can be quite tasking so if you’re less mobile then the elevator would probably be the better option. When you arrive at the rooftop you’ll first pass under many ornate concrete beams which make for a great photo opportunity. You’ll probably have to battle with others here to get a clean shot as it can become quite congested with everyone fighting for the best picture. As you walk along the rooftop you’ll come to another set of stairs taking you up to another level and the open rooftop that gives you the best views over Milan. Here you can see for miles in every direction on a clear day. We were lucky and arrived on a pretty clear morning so could see quite far off into the distance. 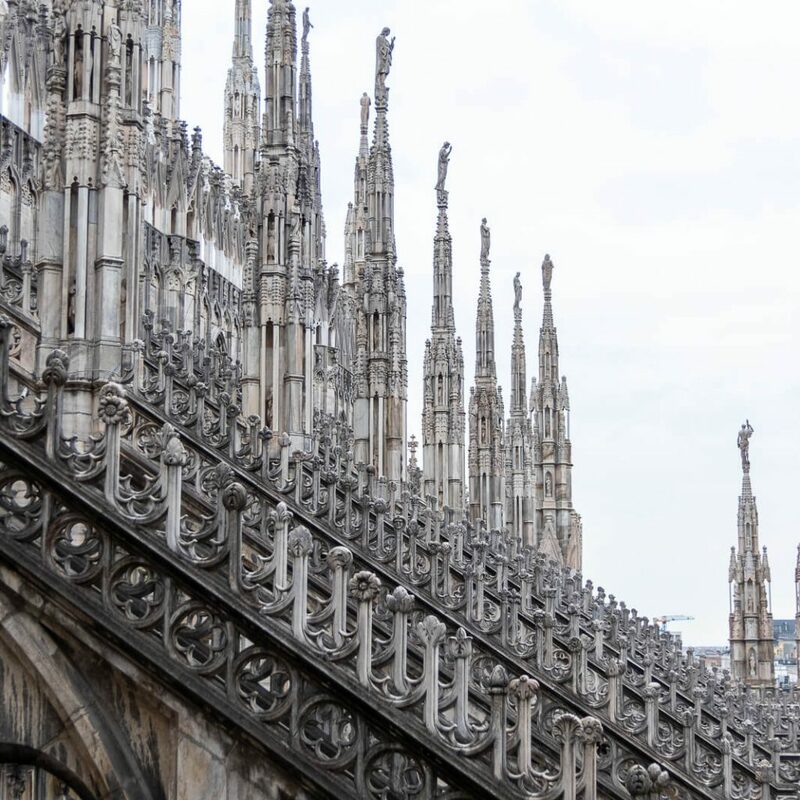 The rooftop also contains many of the statues that give the Duomo the record of having the most number of statues on a building in the world at around 3,400 including the gargoyles. The most notable statue would be the famous gold statue of the Madonnina atop the highest spire which glistens beautifully in the sun. After a bit of time on the roof taking in the views and checking out each of the statues, you can then head back downstairs and visit the interior of the Cathedral which is just as impressive as the exterior. 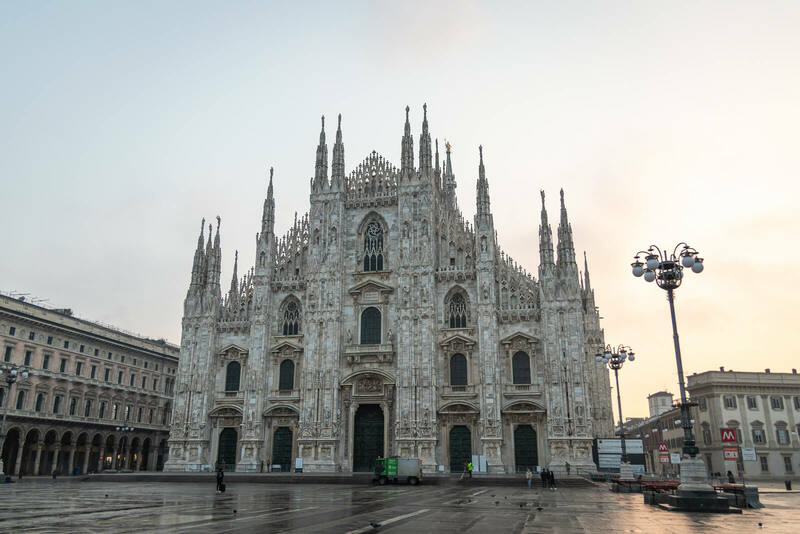 Buy your tickets for the Duomo before you travel to Milan to save time and money. After you’ve done the morning sights and stopped off for a bite to eat, it’s time to head over to Sforzesco Castle. 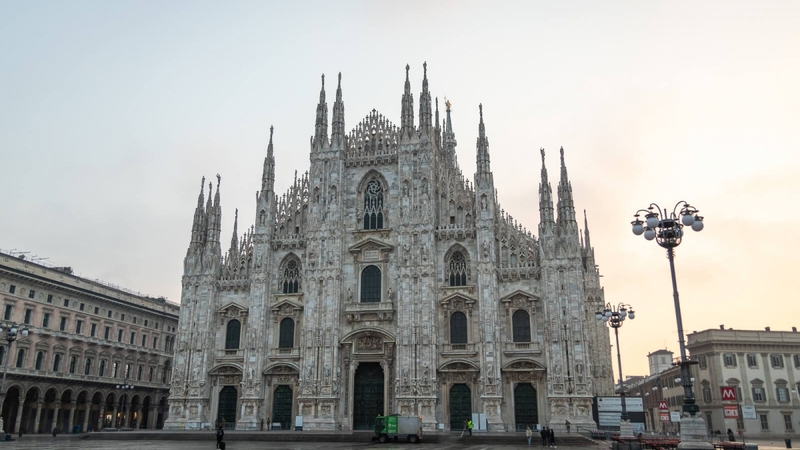 Built in the 15th century and more recently rebuilt and renovated in the early 20th century, this is one of the best Milan landmarks and a must see when visiting the city. Externally you have the beautiful castle itself, as well as the gardens and courtyards, which are all free to access. You could spend hours just wandering the grounds and enjoying an al fresco picnic in the courtyards, but there’s also the inside of the castle to explore. Inside you’ll find a number of museums that hold pieces of art, armoury, egyptian artefacts and much more, all for a standard entry fee of €5 for full access, which is great value for money and a great way to spend an afternoon. Just a bit further along the road from the Sforzesco Castle is the Santa Maria delle Grazie which is home to one of the most famous pieces of art ever created. Housed in this building is Leonardo da Vinci’s “The Last Supper” which remains in its original location within the refectory of the convent. Entry to see the Last Supper is restricted to 25 people every 15 minutes in order to ensure that the room is kept at a certain temperature to preserve the painting. We didn’t head along here, but if you are interested in seeing famous pieces of art then this is one you probably should do. Last Entry is at 6:30pm every evening and it’s worth booking your tickets before you go. Now that the day is winding down, it’s time to yourself along to the Navigli district of the city. This area is famous for being able to relax along the edge of the canals on outdoor seating areas of the restaurants and bars that line the streets. Happy hour starts around 7pm and that’s when this area really comes to life. Whether you’re just looking for a nice evening meal with a bottle of wine, or somewhere to party the night away then this is the area to head to. It has a similar feel to parts of Amsterdam and walking along the side of the Seine in Paris. Hopefully this one day itinerary for Milan keeps you entertained during your trip. Everything on this list is in pretty close quarters, so getting around by foot is easy. 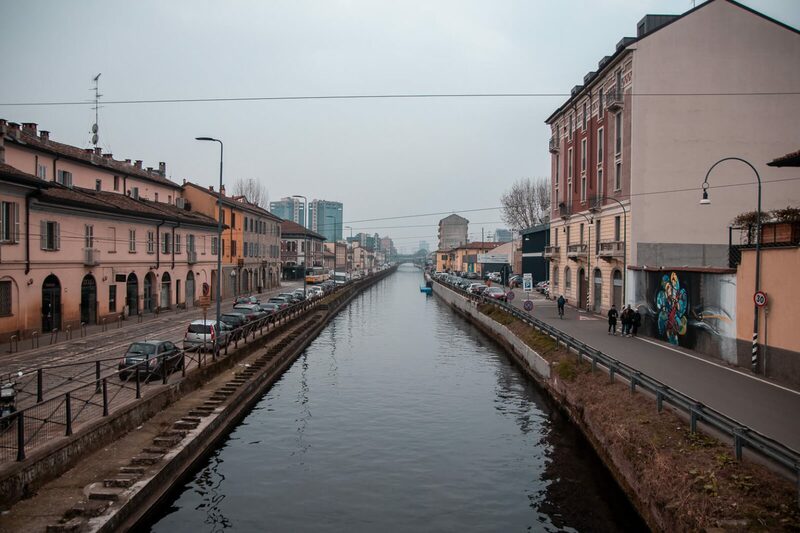 The only part you may need to hop on some public transport would be heading to the Navigli District, but other than that you should be good to just take things at your own pace and enjoy your day. Need somewhere to stay in Milan? Why not check out our Nyx Hotel Milan Review. 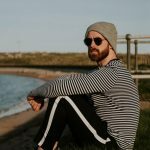 I’m a 32 year old, working full-time as a digital marketer, so more often than not you’ll find me sitting at a computer somewhere. When I’m not sitting at a computer, I’ll usually be eating or in the gym or travelling the world. That’s what I spend most of my free time doing. I love to create content that really let’s people see the things that I enjoy, but also doing so to help others learn from my experiences and passions..